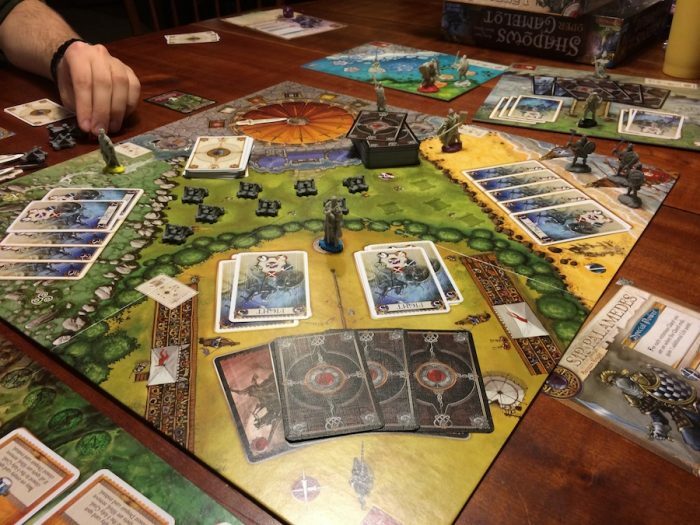 Shadows Over Camelot is a cooperative board game. You play as the knights of King Arthur’s Round Table. You need to protect the kingdom from the Forces of Evil. It’s a cooperative game, but there is usually one player that is a traitor out to help Evil prevail. Your team of knights go on quests to achieve victory. It’s not a simple task though. The Forces of Evil are not working in your favor during the game. We somehow managed to win, but it looked like it was going to be a complete loss for quite a while. All the knights were very close to death and the castle was surrounded by seige engines. There was a very dark shadow over Camelot at that point of the game. After a long and grueling period of questing, the Knights of the Round Table had saved Camelot from the Forces of Evil. It was the first time any of us had played Shadows Over Camelot, but we had a blast. Gameplay should be improved next time we play as we’ll have a better strategy now that we know how the game plays. If you are interested but unsure, I’d recommend checking out Will Wheaton’s Tabletop episode of Shadows Over Camelot. Edit: We played again on Christmas Eve. This time there was a traitor involved. This time Evil prevailed. Halfway through the game, things were starting to look bad. We had 2 white swords and 6 black swords. None of the quests were close to being finished, and it just went from bad to worse. My brother, being the traitor, made sure that the next quest failed, and the game was over. Our strategy that we thought we had, failed to work.